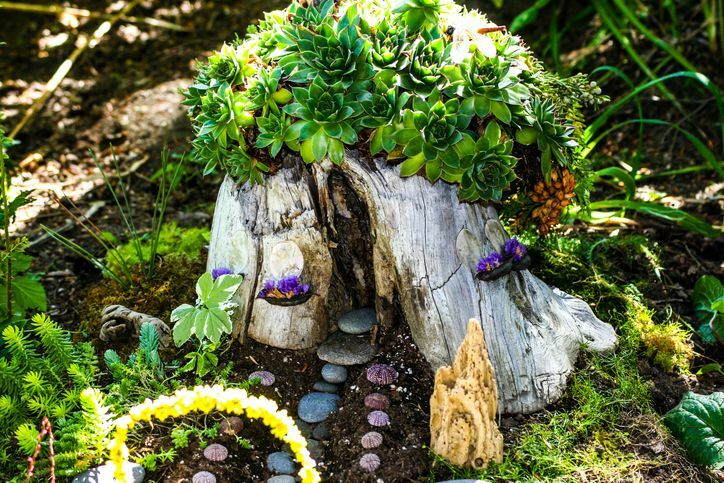 Dress up your garden by making some fun little fairy houses. Your kids will love this imaginative project! You can craft a single house or make an entire town. Most of the items needed to make these houses can be found lying around your yard. Follow these step-by-step instructions to create your own fairy house! Flat bases, such as a piece of bark from a tree. Start by searching your yard for a large, flat base. You can make the initial wall structures out of craft sticks. Glue these onto the base. Choose item for walls, such as twigs or leaves, and use them to cover the outside of the craft stick walls. Use other items you find outside to create walkways, trees, flower beds, windows, antennas, gazing balls, swings, porches, little piles of firewood, and other fairy garden accessories. Just let your imagination go wild. Spray with varnish and you're done. Mini Flower Garden Pots: these are just the perfect size for a fairy garden. Be sure to plant small flowers inside and add them to your garden. Fairy Wand Craft Stick: kids can create their own fairy wand from a simple stick. Decorate it with all kinds of embellishments and kids can use it in their fairy garden playtime.